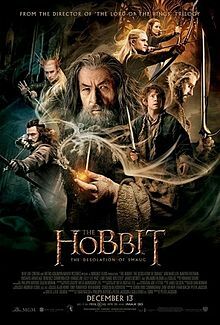 Cast: Ian McKellan, Martin Freeman, Richard Armitage, Benedict Cumberbatch, Evangeline Lilly, Lee Pace, Luke Evans, Ken Stott, James Nesbitt, Orlando Bloom. Screenplay: Fran Walsh, Philippa Boyens, Peter Jackson, Guillermo del Toro. 161 mins. Rated PG-13 for extended sequences of intense fantasy action violence, and frightening images. Peter Jackson continues his return trip to Middle-Earth with The Hobbit: The Desolation of Smaug, a more fun follow-up to An Unexpected Journey, which showed up in late 2012 to polarized reactions. The Desolation of Smaug falls for some of the same pitfalls that troubled its predecessor, but all in all, it is a worthy addition to the epic world created by J.R.R. Tolkien many years ago. We meet up with Bilbo Baggins (Martin Freeman, Hot Fuzz, TV’s Sherlock) and his Dwarf company (consisting of Thorin Oakenshield, Dwalin, Balin, Kili, Fili, Dori, Nori, Ori, Oin, Gloin, Bifur, Bofur and Bombur) as well as Gandalf the Grey, played once again by Ian McKellan (X-Men, Stardust) to rescue the dwarven city of Erebor from the beastly dragon Smaug (voiced by Benedict Cumberbatch, also of Sherlock fame). This is the part of the story where we really get to the meat of Tolkien’s epic journey. The performances here are at the top of their game. McKellan makes me fear for the beloved wizard for the first time since The Fellowship of the Ring. I can honestly say that I was unsure that we would be seeing Gandalf again after he breaks away from the group to hunt down the location of the foreboding Necromancer we keep hearing about. You can tell Freeman is getting more comfortable with the weight he now carries in this franchise, as Bilbo is now more comfortable with his stake in things as well. Bilbo definitely takes a step back though, for a sizable amount of this film so that we can focus on other characters. Richard Armitage (Captain America: the First Avenger) has more to do in this film than just brood, which is a welcome addition. Let’s get to Benedict Cumberbatch, who has received a lot of talk since this film was release barely over a month ago. Other critics of this film claim that he is nothing more than a name tacked on to this film and that his voice-work for both Smaug and the Necromancer could have been done by anyone. I will disagree with this claim, let us not forget that Cumberbatch also did performance capture for the characters and I feel like he adds a layer of tone and inflection to what could’ve been stock bad guys in a fantastical backdrop. Lee Pace is finally given the chance to boast some acting chops in this film, after completing what could be thought of as a mere cameo in An Unexpected Journey as the Elvenking Thranduil, father to Legolas, who also returns to the series played again by Orlando Bloom. Desolation also brings some new faces to the world of Middle-Earth, one in particular, Tauriel, portrayed by Evangeline Lilly, is a completely original character, who gets some nice screen time with Aidan Turner’s Kili. We also meet Bard the Bowman, who is introduced much earlier and given more to do than in Tolkien’s original work. For those of you who are fans of the book, we will be seeing Bard again. The Hobbit’s gorgeous cinematography and high-frame rate compliment this more-actionier installment, especially when Bilbo and company take a rather exciting barrel ride down a river. The music is definitely owed dues once we encounter Lake Town. Howard Shore really creates some new auditory wonders for us as we edge closer to Erebor. As per usual, the visual effects are stunning and magical without taking us away from the real reason that Thorin and Bilbo have come all this way. Really, the only thing I can see film-goers not loving about this film is the length. Jackson and fellow writers Fran Walsh, Philippa Boyens, and Guillermo del Toro (who worked on the script when he was originally attached to direct) have bulked up this story a lot more than the 300-page novel had, we will call it Epic-sizing it up to turn a novel shorter than that of any of the individual Lord of the Rings books into a 9-hour love letter to Middle-Earth. I am a big fan of Tolkien’s original work and Jackson’s storytelling, so the length really doesn’t bother me, but I can see how casual viewers may not be as swept up as I was. The film ends on somewhat of a cliffhanger, and I have to say that I’m not sure I can wait a year to revisit this world, but fans fear not, I’m sure we’ll get an extended edition of Smaug soon enough. 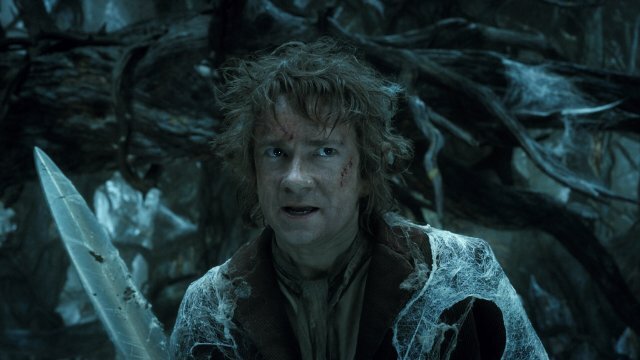 For my review of Peter Jackson’s The Hobbit: An Unexpected Journey, click here. For my review of Peter Jackson’s The Hobbit: The Battle of the Five Armies, click here. For my review of Peter Jackson’s The Lord of the Rings: The Fellowship of the Ring, click here. For my review of Peter Jackson’s The Lord of the Rings: The Two Towers, click here. For my review of Peter Jackson’s The Lord of the Rings: The Return of the King, click here. For my review of Peter Jackson’s The Lovely Bones, click here. New “Friday the 13th” to be a Reboot Again and a Found Footage Film?? ?